The quality and size of this bedspread is perfect!! 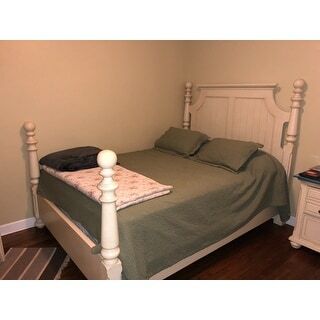 The color we chose matched the curtains I already had in the room,(from Overstock as well!) perfectly! Superior is excited to expand its existing line of elegant bedspreads. Dive into a warm and comfortable tranquility with Superior's new woven Matelassé Oversized Medallion solid bedspread. Well-made and finely spun with soft but sturdy 100-percent cotton, this textured monochrome design gives a whole new look to a classic medallion pattern for the ultimate in luxurious comfort on your bed. The tailored, double-woven, solid color matelassé bedspread has an eye-catching regal medallion pattern with florals and lattice motifs that boasts sophisticated style and old-world charm. The extra-generous size eliminates the need for a bed skirt, as this bedspread will reach all the way to your floor. The subtle medallion pattern will look stunning on your bed giving a classic finish to your bedding ensemble. The beautiful medallion is raised for an elegant textured look which will pair easily with your existing decor and is sure to add a new decorative element to your bedroom. This bedding is available in a wide range of beautiful, colorfast and machine washable solids: black, deep sea, garnet, ivory, linen, mandarin, navy blue, peach, sage, silver, and white. I am somewhat disappointed in this set. I bought (2) of the black in Queen size. I can confidently say that I hate the shams. The opening is on one end of the sham, instead of in the middle, and it is definitely NOT equipped to house an oversized or thicker pillow. Secondly, the set that I opened this morning has two areas in the bedspread where it looks as if it has been washed with too much powder detergent and it didn't rinse out well. That's the best way I know how to describe it. On the positive side, I do like the 100% cotton fabric. And the oversized bedspread, though it still does not reach the floor on my mattresses. I will most likely return both sets. Update - I have decided to keep these sets. As I inspected the shams closer, I noticed an end flap that actually folds over the end of the pillow, so I don't hate them anymore. After I got the room finished, with both beds covered, it actually looks pretty awesome. Completely changed the dynamics of the whole room. I do wish the spreads were a little wider so as to reach the floor, but I do have oversized mattresses, and I can live with it. Before purchasing two twin-size bedspreads, I checked the width: 81 inches. Unfortunately, even following the cold-water wash, low-temperature dry instructions for this 100% cotton fabric, I ended up with one spread at 75" wide and the other at 78". This is annoying because was trying to get away from bedskirts. Also, if you are a person who straightens pictures on walls, you may not like the fact that the medallion pattern on these bedspreads is not centered. Fortunately, the pillow sham patterns are not off-center, and they match. The fabric is good quality, and I like the color I chose - linen. The features that I find positive about this set are that it’s cotton, solid color, and made in India (I find Indian fabrics much better quality than from China). On the otger hand, the cover is much thinner than expected, and is overpriced. I would recommend this set for a guest room, but would hesitate to buy it for frequent use (the stitches don’t look very strong). I had ordered this item in a king size for my king size bed. I had accidentally ordered the wrong color but was going to keep it because I liked the pattern. However when I tried to put it on the bed the sides were very long. But the worst part was at the foot of the bed. It hung so far over that tucking it in wasn't even an option. Going to return this product. This bedspread is wonderful. It is made with a quality cotton that breathes yet it's warm. It actually fits my twin xl bed with the sham or I can use it for my twin and wrap the pillow under the spread. Shipping was fast. Hats off to a good product that's made well and actually fits the bed floor to floor and not look messy.! Thank you. This bedspread is true to size, it says it's for a queen size and it is. It is warm, yet it breathes so you stay comfortable. Lovely bedspread with a generous drape to the floor on my bed. The material is a little lighter weight than expected, but it's perfect for the summer. Very pretty pattern, not too busy or plain! Beautiful spread ,true to color and fits my bed perfectly. It is light weight but not thin,really warm but in no way heavy.I would recommend. Very nice bedspread. The pillow shams are enormous, they need a king size pillow for sure. Nice pattern and the navy blue is just the right shade. Great bedcover for the summer months and used over a blanket for the rest of the year. Would purchase again. Nice but wrong shade of gray. I received this bedspread but had to return it as the color was more steel blue than silver. The return process went well though so that's a plus. Beautiful and light weight. Bought the king size and goes to the floor all the way around. Love it! Very nice bedspread! It's heavy enough so you feel like you're covered but not too heavy where you start to sweat. In the winter, if I get too cold, I have a throw I use as my hubby is comfortable with just using the bedspread. And if I get too hot, I just remove the throw, so it works out. Fits well. Covers the pillows, like a bedspread should. Washs up nice. Looks great on bed. Very disappointed!! Very thin; does not feel like a bedspread, more like a summer blanket. "Are corners curved or square? If curved, are all 4 corners curved so bedspread can be turned?" It is all cotton and I liked the color. "where is linen in the color selections? I only see white, peach and ivory?" "Is this a true peach or more of a pink color?" "What is the actual size and weight of this bed spread?"